Blog - Spahn & Rose Advice, Industry News, Trends and Interesting Info! Spahn & Rose is a leading window dealer, every year helping thousands of contractors and homeowners select the right windows for their project at the right price. With decades of experience, Spahn & Rose’s window experts can assist with price quotes, product selection and installation advice. They’ll also visit the home or building site to ensure accurate estimates for window sizing, making installation quick and easy. As an authorized Andersen, Hayfield and Marvin window dealer, Spahn & Rose will guide contactors and homeowners to their optimal windows. These five are among the most popular window materials. Spahn & Rose is an authorized dealer of Andersen, Hayfield and Marvin windows, which offer options in each. The material you pick will of course affect the windows’ cost, appearance and maintenance. Vinyl windows, for example, will be the same color inside and outside, and require less maintenance than wooden ones. To match historical details of certain homes, though, wood is likely the best choice. Fiberglass windows, such as Andersen’s A-Series, are weather-resistant outside with a lustrous wood interior. Your material will also affect your available choice of color. Clad windows come in fewer hues but are less expensive, while vinyl windows typically offer about 50 colors. The most common window type is double-hung, in which the window sashes move up and down. Most window manufacturers offer tilt-in sashes, which makes cleaning both sides from inside the house a cinch. Casement windows open via crank. They stay sealed better than some varieties and generally offer a clearer view because they lack a sash bar running through the middle of the pane. However, they can be more difficult to clean than double-hung windows. Awning windows have a hinge on top and open from the bottom. They provide good ventilation, can be placed higher on walls and can remain open when it’s raining. Like casements, awning windows can be tricky to clean, and they should be avoided near outdoor walkways where they might pose a tripping hazard. Sliding windows that go from left to right can be a good choice for areas that open onto a patio or deck. They might not seal as tightly as some windows, though, and rain will sometimes collect in the track at the bottom. As an authorized Andersen, Hayfield and Marvin window dealer, Spahn & Rose offers several glass options. The industry standard is a double-paned window; argon gas can be pumped in between the panes for better energy efficiency. Triple-paned windows are even more energy-efficient, but they cost more. Solar glass can decrease UV-ray exposure, if you’re concerned about flooring or furniture fading from too much sun. In Iowa, Illinois and Wisconsin, the most popular choice is low-emissivity glass (known as low-e glass), which is coated in microscopic layers of metallic oxides to reflect heat back out during the summer and keep it inside during colder months. The glass you pick might also depend on window placement in the home—opaque glass in the bathroom, for example. Most building codes, too, require that glass within 18 inches of the floor be tempered so it won’t break into shards. Glass in stairways is often tempered as a safety measure as well. Fiberglass and vinyl need the least maintenance; their frames will typically need to be cleaned about once a year. Wood windows require the most care. In addition to being painted or stained upon installation, wood needs regular attention to guard against rot and mold. Anytime paint starts flaking off a wooden window, water can potentially get inside. Double-hung windows are easiest to clean. Casement and awning windows can be harder to reach and access from the second story of a home. To add an attractive look to windows, contractors and homeowners sometimes opt for grilles. Variations of grille style include prairie, colonial and contemporary. Built-in blinds are another optional convenience. They’re low-maintenance, with no need to worry about dust or shifting blinds. As an authorized Andersen, Hayfield and Marvin window dealer, Spahn & Rose also offers a complete line of window hardware to match any interior design. 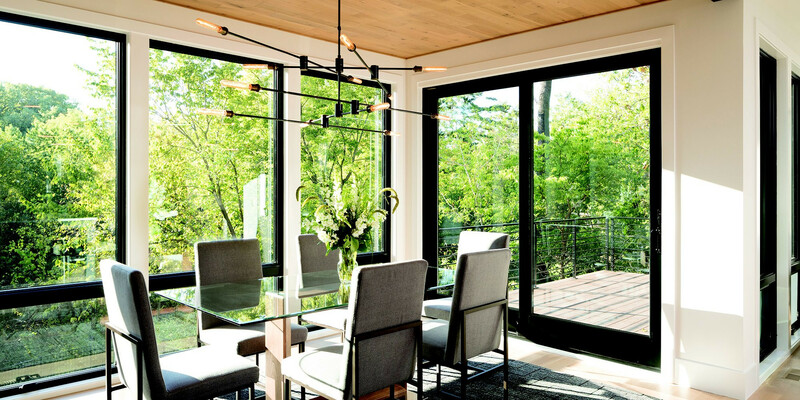 Marvin offers Marvin Shades which are fully integrated, matching interior finish, and appearing to be a seamless part of the window or door with no visible cords or pulleys. Throughout April, Spahn & Rose celebrates its 115th anniversary of serving Iowa homebuilders and contractors. One of the longest continually operating lumber suppliers in the country, Spahn & Rose was profiled in a recent issue of Hardware+ Building Supply Dealer magazine (HBSD). The article chronicled Spahn & Rose’s rich, more than century-old history, and shared CEO Dave Davis’s vision for the future. Along with recounting how Spahn & Rose has weathered many challenges—the 1911 lumberyard fire, surviving the Great Depression and much more—the article detailed how the company continues to grow, citing its recent acquisition of Dunn Lumber in Geneva, Wisconsin. Davis told HBSD that Spahn & Rose will continue to be more aggressive and disciplined in obtaining new customers while also expanding product and service offerings to complement the company’s existing business. HBSDalso covered Spahn & Rose’s strong commitment to community service, describing the creation of the Spahn & Rose Foundation, founded in 1950 to improve the lives of those within the company’s service area.